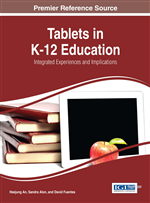 In contrast to traditional teaching methods and rote memorization techniques that have led to shallow student learning in middle grades social studies, this chapter explores the capacity for a tablet-enriched implementation of the Teaching for Understanding framework to facilitate deeper student understanding and knowledge construction within the sixth grade social studies curriculum. Based on the outlined tablet-infused teaching and learning strategies, not only would the learning of social studies be improved by use of the framework itself, but the additional leverage of tablets and apps would provide a dynamic, student-friendly platform for successfully executing the framework's four elements: a generative topic, understanding goals, performances of understanding, and ongoing assessment. Moreover, a tablet-enriched implementation of the framework uniquely extends opportunities for effective learning through a broad range of inquiry, collaboration, and product-creation activities in the sixth grade social studies classroom. Based on research by the Harvard Graduate School of Education from 1985-1998, the Teaching for Understanding framework scaffolds a series of effective teaching strategies gleaned from analyzing an array of successful teaching case studies (Wiske, 1998; Wiske, Franz, & Breit, 2005). This framework consists of four elements: generative topics, understanding goals, performances of understanding and ongoing assessments (Wiske, 1998). By using the framework, teachers in the Harvard research project discovered and successfully implemented practical methods for developing deeper understanding in students, as well as ways to create curriculum units that engage students in thinking that connects their learning across curricular areas and into their lives outside the classroom (Perkins & Blythe, 1994; Unger, 1994; Wiske, 1998). Whereas traditional direct instruction and rote memorization techniques may facilitate temporary student acquisition of information, use of the Teaching for Understanding framework has the potential to assist students in gaining a systemic perspective that can create adaptable and transferable knowledge understanding. The exploration of the topic within this framework includes practices that additionally develop personal responsibility and connected learning that contribute to true student-owned learning. Moreover, in specific reference to instruction of the social studies, the principles of the Teaching for Understanding methodology align with those of the recently released College, Career, and Civic Life (C3) Framework for Social Studies State Standards (National Council for the Social Studies, 2013), which prioritizes the role of inquiry-based learning and the communication of student conclusions through a variety of means to diverse audiences. Beyond acknowledging that these elements lead to a higher quality social studies education, the National Council for Social Studies further states, “Young people need strong tools for, and methods of, clear and disciplined thinking in order to traverse successfully the worlds of college, career, and civic life” (2013, p. 6). In this way, the Teaching for Understanding framework offers multifaceted benefits to teaching and learning.